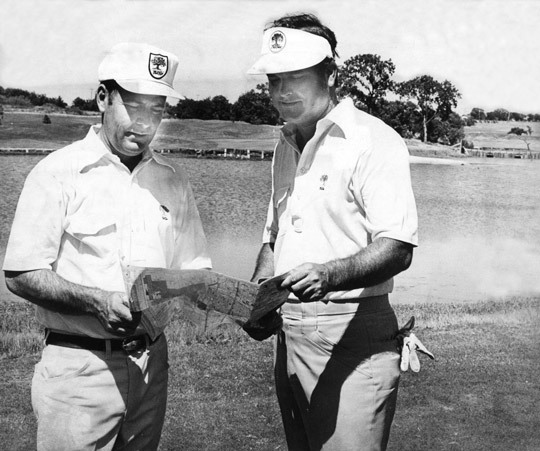 Designer Pete Dye and Joe Walser discuss the Oak Tree layout in 1976. Courtesy The Oklahoman. Joe Walser Jr, long-time Oklahoma City golf pro, co-founder of Oak Tree National and later a leading developer of some of the nation’s top golf resorts while a vice president of Landmark Land Co. died Thursday in Dallas after a long battle with Alzheimers. Walser was 79 and would have reached his 80th birthday May 14. A long-time PGA professional who worked at Yukon Country Club, Lake Hefner Golf Course and for 15 years was head professional at Oklahoma City Golf & Country Club, Walser built a reputation as a friendly, trustworthy pro with a sharp eye for talent. When he teamed up with hard-driving Texas pro Ernie Vossler, it was one of those magical pairings which helped both their careers skyrocket. 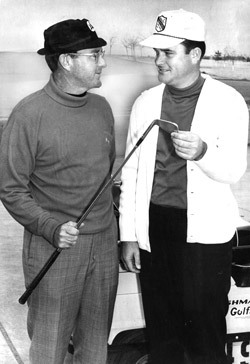 In 1971, Walser and Vossler formed Unique Golf Concepts. 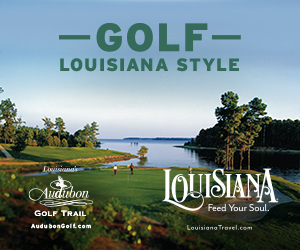 After adding their friend Johnny Pott, they began the development of Marsh Island Golf Club in Ocean Springs, Miss., along with The Cardinal Club in Greensboro, NC and Oak Tree Golf Club. In 1974 Landmark Land Co. purchased Unique Golf Concepts and Walser was named vice president in charge of of golf operations, golf course design and construction while Jerry Barton joined as the development expert. Walser worked closely with Pete Dye on the construction of both Oak Tree Golf Club, which opened in 1976, and later Oak Tree Country Club, which opened in 1981. Oak Tree founders Ernie Vossler, left, and Joe Walser. Courtesy The Oklahoman. The Oak Tree and Landmark logo would later become one of the most recognizable symbols in golf. Walser and Vossler spurred the development of PGA West and LaQunita Hotel Golf & Tennis Resort. Other famous golf and real estate ventures the duo worked on include Mission Hills, Carmel Valley Ranch Resort, Kiawah Island Inn and Golf Resort, Palm Beach Polo and Country Club and Moreno Valley Ranch. Gil Morgan was one of the first to accept Walser’s invitation to join and live at the new club. The course opened in 1976 and the first houses were built in 1978. Morgan moved in in 1979 and has been there since. Walser saw early the value of having pros like Morgan, Tewell, Danny and David Edwards, Mark Hayes, Bob Tway, Scott Verplank and others live and golf at Oak Tree and wear the logo on Tour. He made it easy, fun and convenient for them to be members. Oak Tree, one of Dye’s masterpieces, hosted the 1988 PGA Championship and was awarded the 1994 PGA Championship. But Landmark got in a fatal scrap with the Resolution Trust Corportation and later lost most of its assets. The epic battle with the government took a huge toll emotionally, physically and financially on both Walser and the ailing Vossler, for whom Arnold Palmer and Jack Nicklaus combined on a fund raiser last winter to help him meet his expenses. Walser has a brother, Terry Walser, living in Edmond. He has two sons, Jeff and Steve, and daughter Susan Cranston of Dallas. Ab Justice, owner of Justice Golf Car Company in Oklahoma City, has been friends with Walser since the two were boys playing at the former Capital Hill Golf Course in south Oklahoma City in about 1941. Alsie Hyden, director of golf at Lake Hefner Golf Course, came to Oklahoma City in 1968 when Walser moved to OKC Golf & CC. The two had been friends since their freshman year at Oklahoma State University. Walser is a big reason so many members of the Oak Tree Gang have stayed in Edmond throughout their careers and helped turn Oak Tree, both what is now Oak Tree National and the nearby 36-hole Oak Tree Country Club, into one of the most successful golf developments in the southwest. When Joe Walser, Jr. attended Capitol Hill High School in Oklahoma City, his golf team won three State Championships. His talents were recognized with a full scholarship to Oklahoma State University where his team won several Conference Championships, and he earned a Bachelor in Education. Walser went on to win 25 amateur tournaments including the Oklahoma State Amateur and the Oklahoma Open, which led him to a successful career in the golf. Walser “turned pro” in 1959 and joined the PGA Tour. In 1970, Walser was presented with the PGA of America Horton Smith Award which recognized his contributions to the education of fellow golf professionals. Walser’s commitment to education and training of the business aspects in the profession of golf is evidenced by his mentoring of many outstanding club golf professionals such as Jim Brotherton Jr., a recent PGA of America Golf Professional of the Year. 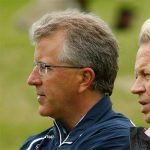 Today, Walser maintains the close ties he developed through the PGA of America and the PGA Tour with the “who’s who” in golf including Deane Beman, Arnold Palmer, Jack Nicklaus, Pete Dye, Jim Awtrey, Pat Rielly and many others who have had an impact on Walser’s life and left him with memorable stories to share. . . 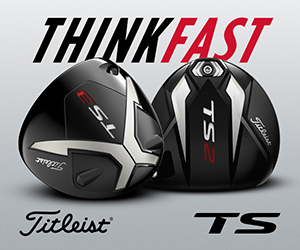 While nurturing very close ties with the PGA of America and the PGA Tour, Walser, Vossler and their Landmark team are credited with being on the cutting edge of golf club membership marketing concepts with “bundled charges” and prominent promotion of the “Oak Tree” logo worn on national television weekly by top PGA Tour and LPGA Tour professionals, many of whom also represent and live in Landmark-developed residential golf communities such as Oak Tree, Mission Hills and PGA West.